Let’s look at how stress effects kids. Stress is a natural part of life, and short-term stress is an essential part of normal development. What we call stress is the body’s response to something it perceives as a threat. When kids experience short-lived stress, it gives them the opportunity to develop the skills and resilience necessary to deal with stress as an adult. However, prolonged stress, or stress without supportive relationships to help a child feel safe, can lead to long-term negative health effects for your child. Here, 3 things to know about stress and children. 1. Flight or Fight: Stress signals the brain to start a chain reaction, often referred to as the “flight or fight” response. This response causes a rise in heart rate, breathing rate, blood pressure and muscular tension. When a stressful situation involves actually having to fight or flee from a predator, these physical effects of stress are advantageous. However, these physical demands are often not useful in response to modern cause of stress and can leave kids feeling tense and overwhelmed. 2. Constant stress is a serious health issue. According to Harvard University’s Center on the Developing Child, “the constant activation of the body’s stress response systems, especially during sensitive periods of early development, can be toxic to brain architecture and other developing organ systems”. Unchecked stress can lead to sleep issues, irritability, ulcers, fatigue, headaches, anxiety, lack of motivation and sadness. 3. Yoga for Stress. 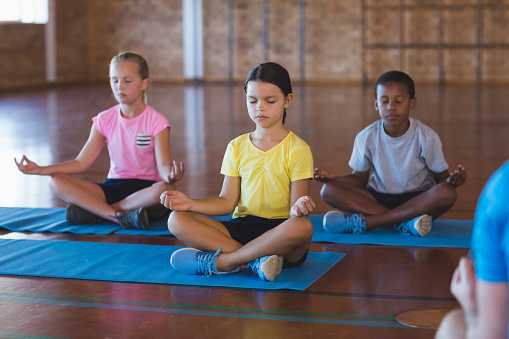 If your child seems to be suffering from long-term effects of stress, consider yoga as one tool to address stress. Yoga is not only a physical activity but also promotes awareness, attentiveness and emotional self-regulation, all essential skills for dealing with stress. If you are considering yoga for your child, KareBoost Health offers Kids Yoga every Monday at 5pm. Kids Yoga is a fun, interactive class open to beginners and advanced kids. Kids can stretch and strengthen at their own pace, all while developing self-awareness and emotion regulation. Worried about how stress effects kids in your house? You can also work with our Stress Reduction Coaches to learn new Relaxation Techniques to manage stress better. Summer is a great time to prepare for the stress during the school year. Is your teen getting too much exercise? Exercise has many positive benefits, but like anything, too much exercise is not healthy either. 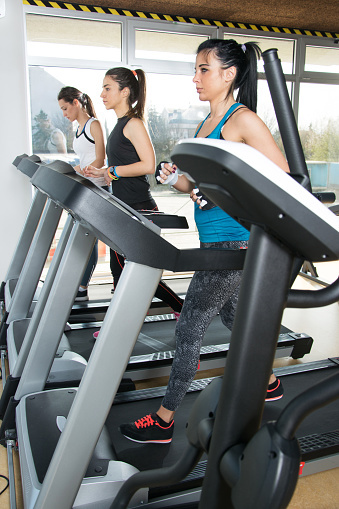 Compulsive exercise is defined by a person feeling compelled to exercise, instead of choosing to do so, and struggling with guilt or anxiety if unable to exercise. Defining an appropriate activity level for everyone can be difficult as each individual’s exercise needs are varied. 1. Multiple Workouts a Day. Although some teens, especially those involved in sports, are more active than others, several workouts a day is probably overdoing it for almost anyone. Also, if your teen exercises even if they are ill or injured, or choose exercise regularly over time with friends, it might be a sign they are overdoing it. 2. Eating Disorders. While compulsive exercise does not always occur with an eating disorder, the two often go hand in hand. In anorexia nervosa, the excessive workouts usually begin as a way to control weight. As activity increases, the amount a person eats decreases. A person suffering with bulimia may use exercise as a way to counter binge eating. 3. Pressure on Student Athletes. If your teen is a student athlete, be aware of the pressures surrounding student athletes. Pressure from external sources, such as coaches, peers or parents, and internal pressure can drive a teen to go too far. More workouts do not equal better workouts, and too much exercise can lead to injury. If your teen is struggling with compulsive exercise, consider working with a health coach to help your teen come up with a healthy exercise plan that leaves room for school, friends and other activities. A health coach can help your teen set goals within the context of moderation. You can also work with our Pediatric Registered Dietitian to help with their eating disorder. 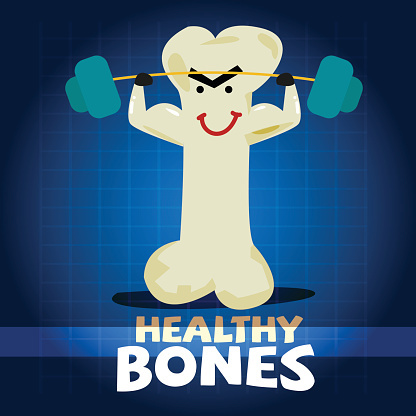 Strong bones are important for kids, as children build about 40 percent of their bone mass between the ages of 9 and 14. Girls reach 90 percent of their bone mass by age 18, and boys reach 90 percent of their bone mass by age 20. Nutrition and physical activity have a large impact of bone health, and here is how you can help your kids build strong bones. 1. Diet is Key to strong bones. A diet that builds strong bones must include calcium, vitamin D, magnesium and vitamin K. Calcium: The best sources of calcium are low-fat diary like milk, cheese and yogurt, but almonds, broccoli and kale also have calcium. Many foods such as cereal and non-dairy beverages are calcium fortified. Vitamin D: Vitamin D can be difficult to get through diet, as there are just a few sources including egg yolks and fatty fish such as salmon and tuna. Talk to your pediatrician about giving your child Vitamin D supplements. Magnesium: Good sources are almonds, spinach, black beans, peanut butter and whole wheat bread, Vitamin K: Look for food sources of vitamin K from green leafy vegetables, such as kale, cabbage, spinach and broccoli. 2. Exercise Builds strong bones. Regular weight-bearing exercise stimulates bones and makes them stronger. Walking, running, gymnastics, soccer, dancing, and hiking are all great weight-bearing activities. Your child does not have to play an organized sport to build strong bones- walk or hike together as a family to meet your activity needs. 3. Things to Avoid. Smoking and drinking alcohol can compromise bone health, but so can dieting, disordered eating and under-eating in pursuit of athletic endeavors. Talk to your doctor if you think your child might be dieting or under-eating. For ideas on healthy grocery shopping, meal planning and other ways to help your family live healthier, consider working with one of our health coaches. A health coach can help you set goals and find realistic ways to reach those goals. Lactose intolerance occurs when the body makes too little of the enzyme lactase, which the body needs to break lactose down into glucose and galactose. When there’s not enough lactase in the body, lactose doesn’t get broken down in the small intestine, and instead passes into the large intestine where bacteria ferments it into gases and acids. For many kids, this means that a glass of milk or a scoop of ice cream can result in cramps, gas and diarrhea. You should discuss these symptoms with your pediatrician to make sure that it is not related to other health conditions. If you know or suspect that your child may have lactose intolerance, here are 3 things to know. Lactose Intolerance is Manageable: If your child has been diagnosed, know that this can easily be managed with dietary changes. For some people, lactose intolerance can be permanent, but for some children, lactose intolerance is a temporary condition following a gastrointestinal infection or after taking antibiotics. Lactose Intolerance is Easily Diagnosed: In most cases, doctors diagnose lactose intolerance through a simple hydrogen breath test. If you suspect your child has lactose intolerance, consult your doctor first. Your doctor can rule out other conditions, such as acid reflux and celiac disease, and discuss dietary changes if your child has lactose intolerance. What to eat? If your child has been diagnosed with lactose intolerance, first discuss dietary changes with your child’s doctor. They may suggest eliminating dairy, but this is not always the case. Not everyone with intolerance is sensitive to all dairy: for example, some children may tolerate cheese but not milk. You may want to start keeping a food diary that tracks what foods irritate your child, and what foods are well tolerated. Also, make sure to add in calcium rich foods such as calcium fortified non-dairy beverages, salmon and almonds to replace the calcium in dairy. You may even try using lactaid pills before your child eats dairy. If your child has recently been diagnosed and you would like guidance in meeting your child’s nutritional needs while making changes to their diet, consider working with our health coach Dr. Karen. Our health coach can help you devise a meal plan that works with your lifestyle and budget, meets your child’s needs, and makes meeting your healthy goals easier. It may surprise you to learn that what your kids drink can have just as much of an impact on their health as what they eat. 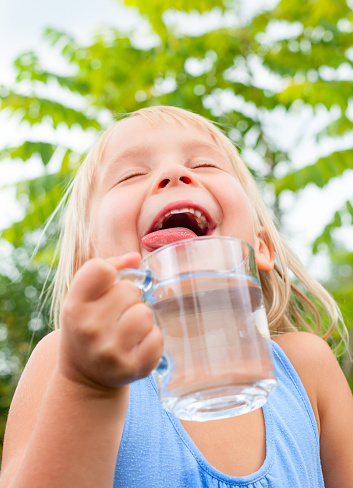 Today, we will discuss the best healthy drinks for kids to keep your little ones healthy and hydrated. Stick to Water and Milk. Water has zero calories, zero sugar and is simply the best way to hydrate. Milk is a good source of calcium, with 300 milligrams in 1 cup. Toddlers age 1-3 should aim for 2 cups of milk or fortified non-dairy beverages, kids 4-8 can have 2 ½ cups, and kids 9 and older can have 3 cups. Choose low-fat or non-fat dairy most of the time. Fruit juice is high in sugar, and your child will get more nutritional value out of eating a whole piece of fruit. However, if your child likes juice, limit it to a cup a day, and always buy juice without any added sugar. Read labels carefully to make sure it is 100% juice. Soda has zero nutritional value, is high is sugar and contains caffeine, which kids do not need. It can lead to tooth decay, excessive weight gain and other health problems. The best way to get kids not to drink soda is to never start them on the habit. If you do not drink it or have it at home, your kids won’t either. By the time your kids are exposed to soda outside the home, hopefully their healthy habits stick. Either way, not serving soda at home will limit the opportunities your kids have to drink it. If you are struggling with implementing healthy drinks for kids or other healthy habits at home, our health coaching team can help. Set up a free consultation with Dr. Karen to see how our holistic approach to healthy living can help your family. From developing weekly meal plans to cooking for specific dietary needs, we are here to support you in your healthy goals.